I get it. This looks like some clickbait title, but hang with me. 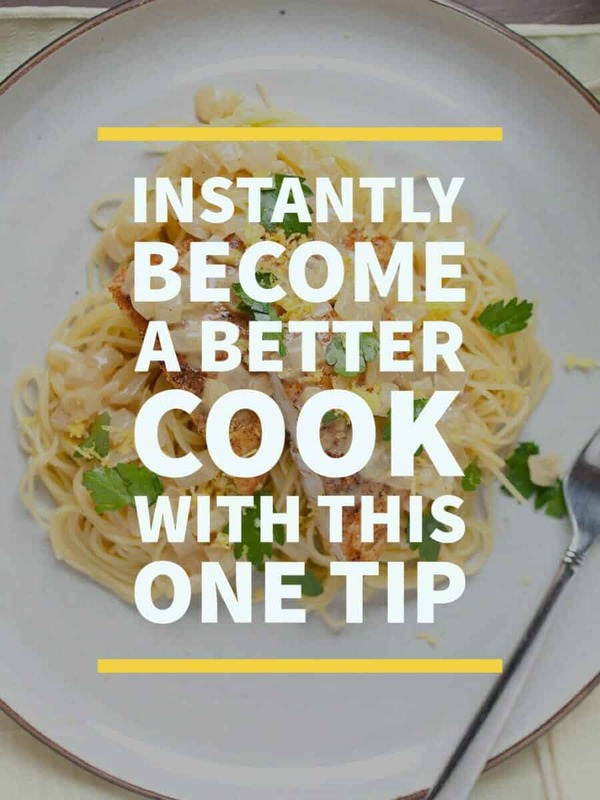 This post actually does contain ONE tip that will make you a better home cook instantly. A few weeks ago I was chatting with a good friend about cooking. He’s also a work-from-home dad and responsible for making a lot of his family’s meals. He cooks simple recipes, but they always turn out great. That might sound silly, but in our hectic world of multi-tasking, snapchatting, and whatever else you have going on, this one tip really can be the difference between a meal mistake and a delicious dinner. If you’ve ever watched a professional chef in a busy kitchen, it might seem like they are doing a thousand things at once. Some multi-tasking is happening, for sure, because they’ve practiced the dishes they are making many times. But, you’ll also seem them occasionally shut off the outside world and focus intensely on certain steps. It might be watching something sear until just the right moment or whisking a sauce until it hits that perfect consistency. Good chefs can flip a switch and focus on the task at hand and then zoom out and take in information around them. Home cooks have a harder time with this for obvious reasons. The home cook likely isn’t making the same recipe every day. They also just aren’t cooking as much, in general. The pieces of the puzzle are harder to identify and that’s why it’s more important to focus on them! Paying attention to something may seem like a lost art in the days of instant gratification and google-the-answer results. Paying attention requires some energy and all five senses. It’s simple but it’s not always easy. Sight – Obviously it helps to be looking at the thing you are paying attention to. It’s okay to glance away occasionally, but keeping a close eye on your food is the first step. Stay close. Watch how the food moves in the pan. Watch how the soup bubbles. There are clues there to let you know how your cooking is going. Sound – I almost always have music on while I’m cooking, but I try to make sure it’s not so loud that I can’t hear my food. The sound of something searing in a pan can tell you a lot about the temperature. You can hear lids rattle if they are boiling too hard. Listening is a skill that’s discounted in the kitchen, but it’s really important for some recipes. Smell – This might be an obvious one because everything you cook gives off a smell, but you may not be really paying attention to that smell. I want you to get your nose in there and really smell the dish. In some cases you can tell if something is too sweet or sour by smelling it. Maybe most importantly, smell stuff before you cook it to make sure it hasn’t gone bad! Touch – People are afraid to touch their food as it cooks, but chefs are constantly touching the food (with clean hands obviously). You can tell a lot by how tense the protein is or how loose the pasta strands are. Good cooks can tell if a steak is cooked correctly or dough is kneaded enough by how it feels. Taste – This is the oh duh sense, but it’s the one that people forget. You should be tasting your food constantly while it’s cooking. Rather than just at the end, it’s easier to adjust seasoning and ingredients while the recipe cooks. For some reason people are scared to do this, but it would be like trying to paint a painting and only looking at it at the very end. Silly. Some of this stuff may require a bit of practice, but it’s things that everybody can do today and will immediately make your next recipe better. Guaranteed. I get that this can be very tough in a busy house on a busy night. Kids, pets, spouses, and whatever else is going on can easily distract from what you’re doing. I thought I’d take a recipe that I make on weeknights and break down how paying attention can make it really delicious. It’s my weeknight crispy chicken recipe! Sight – For this recipe there are some important visual cues. 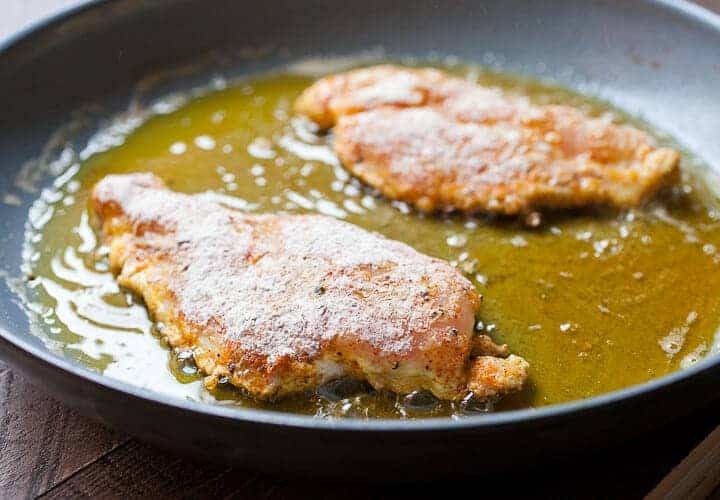 When lightly frying the chicken, I check it regularly to make sure it’s browning evenly and isn’t burning. I don’t check my email while the chicken is cooking. Sound – The sizzle! I can tell when the chicken is near done because it gets quiet. The water is mostly evaporated and the sizzle calms down. I ignore the dog’s barks. Smell – I’m always sure to smell chicken before I cook it to make sure it’s fresh, but there’s a lot of other smell queues in the recipe. Smell the cream to make sure it hasn’t turned, smell the sauce as it comes together to see if it needs more lemon. I toss the extra lemon half in the garbage disposal because it needs it! Touch – This chicken is so thin that you can feel when it’s done cooking. Combined with the sound and visual queue of the browning, a light touch will tell you that it’s done. Also, the pasta! Sure, you could dump your pasta in the water and hope the packaging time is correct, or you could take out a strand every minute or so and feel it. You’ll be able to tell when it’s perfect. I make sure my kiddo has a snack and a toy so I can focus for a few minutes. Taste – Okay. Don’t taste raw chicken. But you can taste the pasta as it cooks for doneness. You can, and MUST, taste the pan sauce at the end to adjust for salt and lemon. Very important! I drink what I’m going to drink with dinner while I cook to make sure it goes well! I like to think I write good recipes that you can just follow, but doing these things are honestly more important than the recipe. Once you get the hang of paying attention, you’ll notice that you aren’t even looking at recipes as much because you know what you’re looking for in each step! Everybody is busy and I would guess that everybody struggles to some degree with this. If we can all just slow down a bit and pay attention, I think everyone can instantly be a better cook. Do you have any tips for how to be more present while you are cooking? Do you think it helps your recipes come out better? Leave a comment! The more I’m around, the more I feel like this ‘one tip’ is the key to not just cooking, but life in general. Being aware of what is happening and being present in the moment applies to so many things. There is a lot of research out there now that says multi-tasking really isn’t that great, that our minds work much better when we can focus on one thing at a time. Not to say that you can’t boil pasta while you are cooking chicken, of course. :D Paying attention (= being present) while cooking makes for better meals. Paying attention when eating that meal makes for a more enjoyable experience and allows you to listen to your body so you don’t overeat. Paying attention to your spouse when he talks about his day – really paying attention and listening to what he’s saying, responding and having an actual conversation – makes for a stronger relationship. The list can go on and on. Paying attention in your life helps you not to miss the important stuff. Thanks, Nick, for this excellent meta post! Thanks Alaina! I really like the reminder to pay attention while you are EATING also! And, just paying more attention, being present, in general. Thanks for the additional comments! Great tip…seems evident, but it’s so easy not to pay attention. I’m guilty of trying to make too many dishes at once. Something inevitably goes wrong! Or, I don’t get everything prepped before starting and I’m frantically trying to find or chop something instead of watching whatever is on the stove. Now that I have a super small kitchen again, I have to scale all that back. One dish at a time. Prep everything in advance. Clean as I go. It’s an adjustment, and one I haven’t really mastered yet! Mise en place, Mise en place, Mise en place. If there is one thing I learned from watching cooking shows: Mise en place. Get everything out of the fridge, pantry, etc BEFORE you start cooking. Skillets, pots, spoons, measuring devices, whatever you need should be at your fingertips. Cut up what needs to be cut up before you start cooking. Push it to the side of the cutting board. Put things back in the fridge and pantry after you are done using them. Sometimes I honestly feel that I’m doing a ballet. Kitchen is not big so I move from counter to stove top to pantry to fridge to trashcan and start all over again. It gives me great comfort to have a meal turn out perfect, quickly and efficiently and of course, taste fantastic. I do however admit to playing candy crush while waiting for something to cook in the oven or boil LOL!!! Obvious but brilliant. Does listening to npr as you cook count? At least you can easily tune it out when you need to focus. What drives me crazy is the profound need my husband (now) and son (did) have to start an important conversation with me as I cook and listen to the news. I can tune out the news without offending npr, but it’s harder to ignore family. I’ve had many discussions with them about this subject. Can it wait half and hour until we’re eating and then I’ll give you 98% of my attention? That’s the joy of dinner. Discussion. Apparently not. The first thing that popped in my mind when I read this post was cooking dinner night after night with my not yet walking son clinging to my leg as I moved around the kitchen. Fortunately it is a small kitchen and I was able to pivot and reach most things without knocking said baby on the floor. When he was old enough to read I made a Do Not Disturb sign for the kitchen. Anyway, always a good reminder. Tune out news; pay attention to food…..